Long goblet drum - skor chaiyam - Site de soundsofangkor ! The music played with is also named chaiyam. Several drums play usually together the same rhythm; they are associated with other instruments depending on the availability and the know-how of each troupe. Drums are tuned with paste of cooked rice mixed with ash applied to the center of the membrane made of cow skin. The head of the drum is always decorated with pieces of fabric of different colors. The skor chaiyam is not represented in Angkorian iconography. If they are goblet drums, they are short ones as skor daey, skor thon or skor areak. This drum come probably from Thailand at an unknown time. Research in this direction should be done. This festival (Thot Kathin) is a Theravada Buddhist ceremony. Lay Buddhists bring donations to temples, especially new robes for the monks. Here, they turn around the pagoda in a clockwise direction before entering the building and offering their gifts. The circumambulation in that direction is a legacy of Hinduism. Two musical ensembles play at the same time without coordination (polymusic): chayam and pin peat. 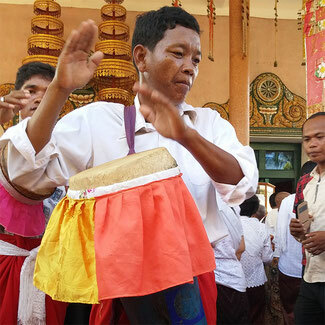 The chaiyam ensemble is composed of 1 drum (chaiyam), 1 bossed gong (kong mong), 1 fiddle (tro sau), 2 drums (skor daey). November 2015. Wat Preah Prom Nath, Siem Reap.